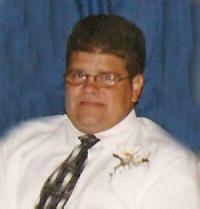 Steven T. Detmer, 46, of New Baden, and formerly of Trenton, died Tuesday, January 6, 2009 at his residence. Mr. Detmer was born October 18, 1962 in Breese to Theodore and Agnes (Ratermann) Detmer; they preceded him in death. Also preceded in death by a brother, Glen Detmer. Sisters, Margaret Jewell of Chesterfield, MO, Rosemary (Jim) Stone of Hillsboro, OR, Phyllis (Bob) Geary of Valley Park, MO, Jean (Kurt) Heier of Trenton, Gail (Patrick) Jones of St. Louis, MO, Dee (Terry) Kahrhoff of Trenton and 3 Nieces and 12 Nephews. Steven formerly worked as a laborer for Kauling Wood Products in Beckemeyer. He was a member of St. Mary Catholic Church and the Trenton Knights of Columbus Council 2932. Funeral Mass of Christian Burial will be Friday, January 9, 2009 at 10:00 AM at St. Mary Catholic Church in Trenton with Fr. Eugene Kreher officiating. Interment will follow in St. Mary Cemetery. Visitation will be Thursday, January 8, 2009 from 4:00-8:00 PM and again on Friday from 8:00-9:45 AM at the Moss Funeral Home in Trenton.